Most people venture to Alaska for the enchanting wilderness – the staggering mountain peaks glistening with snow, valleys rich in fir trees and cascading waterfalls and wildlife sightings around every corner. Drinks are usually an after-thought, something to enjoy after a day of hiking or boating. However, the spirit and beer scene in Alaska demands a deeper dive – a trip dedicated to sampling and sipping every beer, craft gin or infused vodka being produced and shared in tasting rooms throughout the Last Frontier. So what makes these products so extraordinary? The answer is simple – untouched glacial water. To beer producers and distillers, the most important ingredient in any product is water, and it’s safe to say Alaska has every other state beat in providing the most unspoiled H2O. Not only that, the juniper berries, cranberries, spruce tips and raspberries used to produce and infuse each sprit can be plucked from roadside bushes during morning hikes. These ingredients make each product as authentic as the people who produce it. Alaska’s craft drink scene has never been pretentious, which is why it deserves its time in the limelight. This boozy guide takes you to 10 of Alaska’s best craft brewpubs and distilleries, where the distiller’s plaid shirts are worn out of necessity, and the brewer’s beards are anything but ironic. The tasting room may have only been open four years, but the Anchorage Brewing Company is already a top contender in Anchorage’s ever-expanding craft brewery scene. Founded by master brewer Gabe Fletcher, the ales you’ll find on tap aren’t like any others – like the Tide and its Takers, a malty triple boasting high alcohol content but sweet vanilla notes and an almost woody aftertaste, thanks to the multi-phase fermentation. Other popular brews include the Belgian Style IPA and the Saisons, all inspired by Belgian practices and customized with Alaska’s bounty of natural ingredients. The space, located on West 92st street in downtown Anchorage, is just as reflective of Alaska’s landscapes as the brews, with sturdy wood paneling, towering oak fermenters and chalkboards listing the beers of the day. With the poetic sounds of the chilly waves of the Chilcoot Inlet hitting the rocky shore, you can’t find a more picturesque place to sample spirits than Port Chilcoot Distillery. A new addition to the tiny, artsy and oh so quirky town of Haines, the small space – located in a wood paneled former bakery flanked by old whisky barrels – has been producing some of the most talked about spirits in the state. Using fresh glacial water, spruce tips plucked right outside and berries from the roadside, owners Heather Shade and Sean Copeland have truly perfected the art of distilling. They’re most famous for the 50 Fathoms Gin, made from wild juniper berries, cinnamon and imported tangerines, a favorite that has been coveted with awards around the country. However, like most distillers, Sean is looking to the future of the craft – rye, which is why any chats with him (behind the tasting counter or while he hand-bottles) end with an excited smile and a small sample of the whiskey he’s been honing. You can’t talk Alaskan beer without mentioning the true pioneers at the Alaskan Brewing Company. Opened in 1986 by two curious 28-year olds, the brand is one of the first to bring the craft brew movement up to the Last Frontier. While the production has grown quite a bit (from a 2,000 square foot brewing space to a 47,000 square foot space), the passion and dedication to the beer has remained strong. All of their beers have won accolades from even the hardest of judges (like Beer Advocate), but the Smoked Porter (now a limited edition beer) is their pride and joy – with a thick finish, five types of malt, two varieties of hops and just a small hint of smoke. If you’re not a dark beer fan, sip the Freeride APA, a classic American pale brewed with three types of hops and Juneau’s glacial fed waters. Despite it’s small size, the Alaska Distillery, located in the foothills of the Alaska Mountain Range, has become a big player in the craft distillery movement. The owner, a multi-faceted Alaska bush pilot named Toby, has had a passion for Alaska’s nature for decades, which is why each and every spirit reflects its natural beauty and bountiful produce. His specialty is vodka, and you’ll find an inspiring collection of flavors to sample when you visit the tasting room. With an enthusiasm for local products, he even has a smoked salmon flavor – a unique and acquired taste, even for the residents of Anchorage. Sip the Permafrost first, the flagship vodka, to get a taste of the spirit in its most natural state. 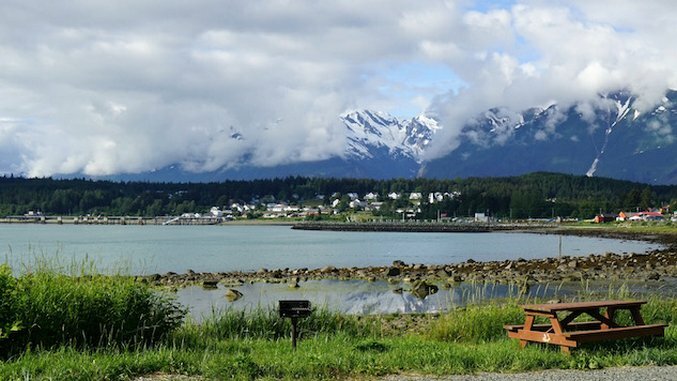 Haines is one of Southeast Alaska’s smallest towns, but it also boasts two of the state’s most inspiring spirt producers and brewers (see Port Chilcook mentioned above). The founder of Haines Brewing Company, Paul, started as humbly as you can – mixing brews in dairy tanks from local farmers in his home. After a few successful years sharing his handcrafted concoctions with friends and family, he quickly expanded to a larger facility – swapping out dairy canisters for closed fermenters. The demand only grew, pushing Paul to finally open a dedicated brewery and tasting room right on Main Street. With stunning views of the Chilcook mountains in the background, you can sip their nationally acclaimed Black Fang – a rich imperial stout featuring plentiful chocolate and coffee flavors. For lighter beer drinkers, try the Captain Cook’s Spruce Tip Ale, a seasonal draft made with local spruce tips gathered around the mountain. Whatever you do, don’t leave the tasting room without a chat with Paul, whose long, untamed beard makes him hard to miss. His love for beer, and his community, is contagious. Just don’t try to Instagram your time there, he’s got a strict “no phone policy” so guests can sip and savor the brews and the building’s backyard beauty without distraction. At home in Anchorage, the King Street Brewing Company has been a local hangout since opening its doors in 2010. With an ever-evolving collection of beers they produce, a few staples remain year round, from the King Street Amber, a rich and complex beer with refreshing citrus notes, to the Oatmeal Brown Ale, a brew inspired by the kinds of beer served in old English pubs. You’ll get a heavy dose of crystal malts, but also a toasted nut, caramel and even toffee flavor on the finish. The small, but inviting tasting room features a rotating tap of their brews, free popcorn and even food truck fare from participating vendors. When you pull up to the tasting room of the Anchorage Distillery, you’ll most likely think you’ve hit the wrong place. Luckily, the strong wafts of ripe juniper berries and wheat grain being fermented hit you as you step inside. The distillery’s story is as interesting as the products. A brainchild of wealthy businessmen in Anchorage, they bought and customized thousands of dollars’ worth of European distilling equipment to craft just one spirit – a honey flavored vodka. Despite the fancy tools and excitement, the locals weren’t impressed – causing the partners to split and sell the distillery. Now owned by Todd Goodew, the distillery is producing some of the state’s smoothest gins, vodkas and whiskeys. For a true taste of the products not muddled with flavors, try the Artic Ice Moonshine Whiskey, an un-aged white whiskey, or the Aurora Borealis Gin. If you’re feeling up to it, give the spicy ghost pepper vodka a try – just be warned, it’s as hot as it sounds. The second largest beer producer in Alaska (right beneath Alaskan Brewing), the bright blue painted Denali Brewing Company sits in one of the state’s most coveted locations – right outside of the National Park it’s named for. In the quaint 1800’s mine-themed town of Talkeetna, the brewery is a hot spot for mountain climbers, hikers and tourists of the park. The shiny, stainless steel barrels in the brewery allow the company to brew three types of beers (900 gallons) at once, keeping the thirsty patrons in the tasting room and around the state satiated. Local favorites include the Single Engine red, a signature IPA style beer with a bright red hue, and the Twister Creek IPA, a traditional brewed India Pale Ale with hints of Alaskan fruit. If you’d rather pair your brew with a bite, their brewpub offers incredible cuisine perfectly fit for their beer, like hearty bison burgers, creamy salmon spread and rib eye pretzel dip. Hidden away in a steel-enclosed industrial park in South Anchorage, the Midnight Sun Brewing Co. has been an Anchorage “must visit” since 1995. Head up to the Loft and grab a seat indoors (or outdoors in summer) to sample some of the company’s fresh Alaskan fare and – most importantly – their beer. The variety is best described as eclectic, with thick and hearty coffee porters and Belgian style tripels to luscious chocolate ales and a devilish barely wine. Not all done in stainless, some of Midnight Sun’s most coveted beers are oak-aged, giving each sip a smoother, almost buttery aftertaste. If they have it, order the Berserker Imperial stout or the Pride Belgian-Style Strong Pale ale to taste the difference. The food is just as good as the beer, with a new special popping up daily. Do yourself a favor and pair the mouthwatering smoked salmon bruschetta with their Pleasure Town IPA. The only brewery on the list located in the harsh northern climate of Fairbanks, HooDoo is truly a brand unlike any of the others. Owner and beer connoisseur Bobby Wilken found his passion while home brewing, and decided to venture out to Chicago and Germany to learn everything he could about the age-old process of beer making. When he got back to Fairbanks, he studied more and finally opened the brewery as it stands in 2011. Using the glacial waters that flow through Fairbanks, the beer here is inspired by both Alaska’s alluring wilderness and Bobby’s German studies. When inside, try the German Kolsh, which uses a collection of ingredients imported from Germany. To kick off the fall season, HooDoo now has their Oktoberfest on tap – a mild but rich malty aroma and smooth finish. If you’re venturing to this German brewhouse in winter, order one of their hearty HooDoo stouts, a beautiful marriage of Oatmeal and Cream stouts with a milk chocolate bite. Plus, HooDoo has a strong partnership with the Alaska Railroad to ensure their brews are offered to passengers seeing the state by railway.